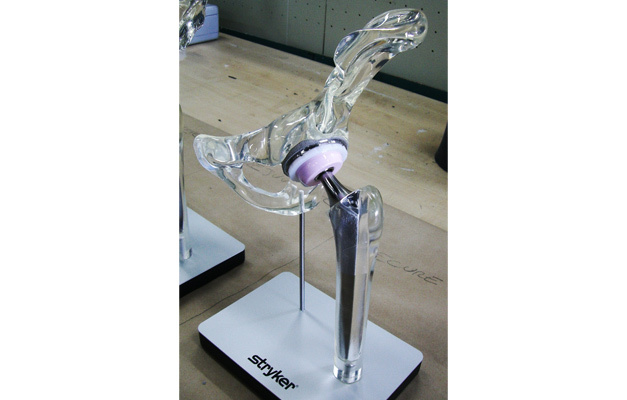 Since working with Stryker in 2004 to design a range of educational display models for their Hip implant collection, we have come to produce medical models for a growing number of medical companies, as well as independent medical practitioners. Each medical display has an individually designed base, and is specifically modified to suit the specifications and dimensions of their unique hip implants. In contrast to many other hip display producers, our medical displays represent a modern and innovative design, created to complement the sophistication and clean lines inherent to the medical industry. Our medical hip displays are of the highest quality with almost all components produced in-house at our Sydney workshop, where they are quality controlled at every stage. These replicas are developed with continuous client involvement to ensure accuracy and can either be cast in stainless steel from a local supplier or machined from brass in-house and then chrome/nickel plated.